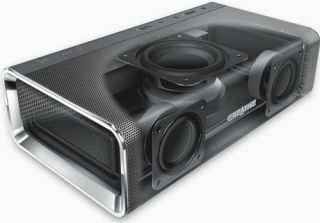 Creative launches Sound Blaster Roar wireless speaker | What Hi-Fi? Creative has introduced the Sound Blaster Roar five-driver wireless portable speaker. The new speaker is designed to rival home stereo systems, as well aiming to become a heavyweight in the current wireless speaker market. The speaker was given a sneak preview at CES 2014 where it received positive feedback, according to its maker. The Sound Blaster Roar connects to mobile devices via Bluetooth and supports aptX and AAC codecs for high-quality audio playback. It also boasts NFC technology for quick connections to NFC-enabled devices. The Sound Blaster Roar has been dubbed the 'Audiophile Sound Booklet' thanks to its relatively small size. It measures 57 x 202 x 115 mm and weighs 1.1kg. It also features a bi-amplified design that uses two amplifiers, instead of the traditional one, found in most other portable speakers. Far-field high frequency front-firing drivers project sound further than most other speakers in its class in an attempt to deliver true, space-filling sound. Active bass and midrange drivers are top-firing, while two side-firing passive radiators – for lower-range audio – round off the five-driver design. The speaker can support phone calls via Bluetooth, and has a MicroSD card slot that supports MP3/WMA/WAV files; it can even skip through folders rather than individual tracks. It has a Bedtime Mode that gradually reduces the volume before shutting down and a Life Saver Mode, which plays random tones and sounds at varying intervals to keep users alert. We're sure this will come in useful, just not sure how. A voice recorder is also built-in with files being able to be saved directly to a MicroSD card. Creative claims the built-in 6000 mAh Lithium-Ion rechargeable battery provides up to eight hours of playback. The Creative Sound Blaster Roar is currently only available in the US for $199. Availability in other regions is expected soon.